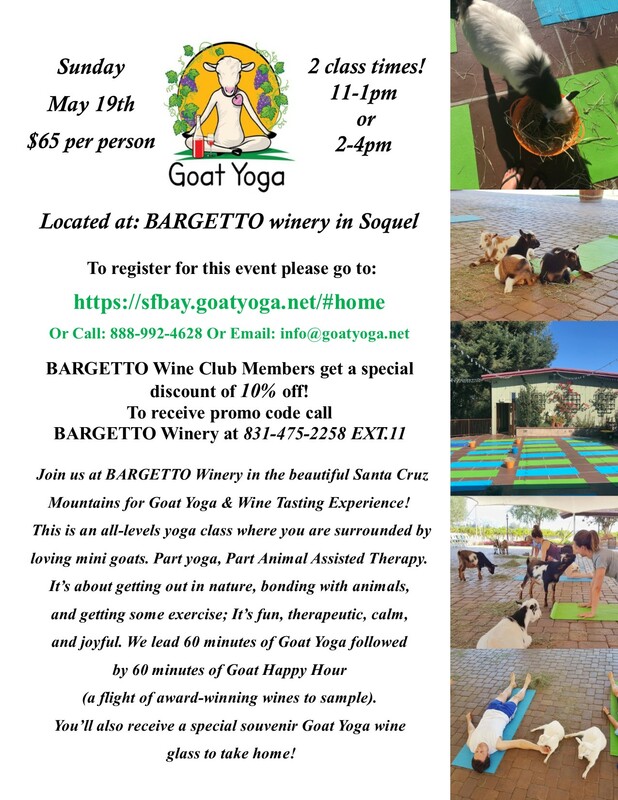 We are excited to welcome back Original Goat Yoga for our 2nd Annual Goat Yoga at BARGETTO! Join us for an all-levels yoga class where you will be surrounded by loving mini goats. Part yoga, Part Animal Assisted Therapy. It’s about getting out in nature, bonding with animals, and getting some exercise. It’s fun, therapeutic, calm, and joyful. Enjoy 60 minutes of Goat Yoga followed by 60 minutes of Goat Happy Hour (a flight of award winning-wines to sample). You’ll also receive a special souvenir Goat Yoga wine glass to take home! Guided yoga instruction, yoga mats, goats, wine, souvenir goat yoga wine glass and lots of laughter. What more could you want?